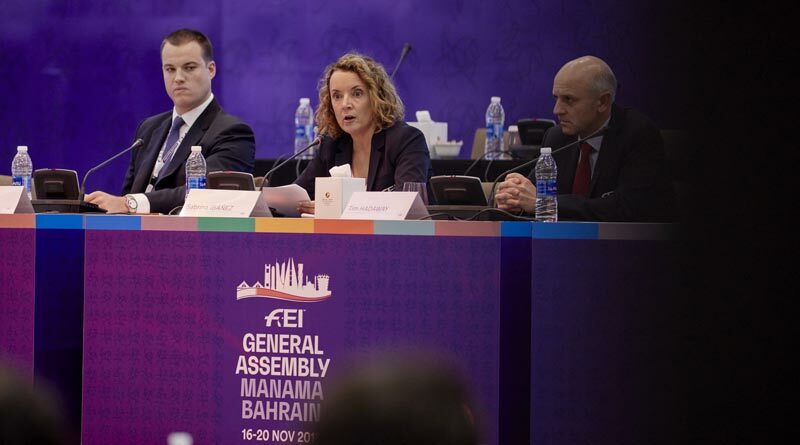 Changes to the approach to FEI world championship events “does not necessarily mean the end of the FEI World Equestrian Games”, the organisation’s secretary-general says. Ibáñez also acknowledged that, despite the FEI’s commitment to support the Organising Committee, in particular during the latter stages of event preparations, the FEI had no realistic mechanism to push the Organising Committee to deliver on its promises other than threatening to cancel the Games, which was not an option due to the time and resources that National Federations and athletes had invested in preparing for the Games. Lack of venue readiness and an under-resourced Organising Committee, both from a financial and personnel perspective, were major negatives that ultimately impacted the delivery of the Games. Before opening up the meeting to questions from the floor, Ibáñez talked through the plan to open up the bidding process for individual world championships in all disciplines for 2022, but with preference being given to multi-discipline bids. FEI Director Games Operations Tim Hadaway presented a report on the planning and delivery of the Tryon 2018 Games, highlighting both the positive and negative aspects of four key areas: Sport, Games operations, commercial, communications and media operations. The FEI said top sport (with the exception of Endurance) was the key success of the Games, along with major broadcast coverage on NBC in the US market, including 57 hours of live coverage that resulted in a record audience for equestrian sport.